Lazy fall weekends lend themselves so beautifully to meals like this one that I couldn't resist not sharing it with all of you. 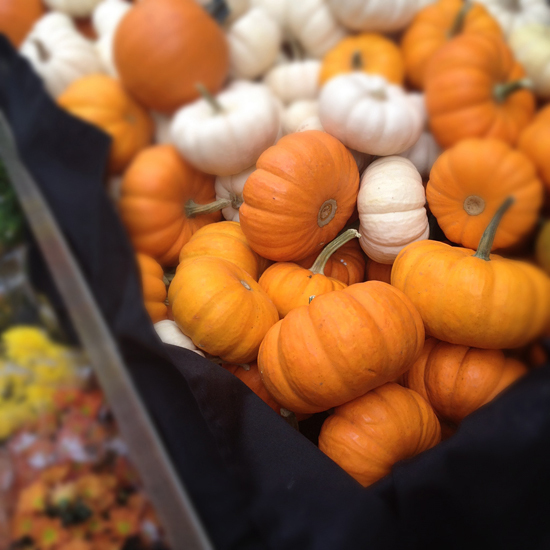 Now that the leaves have started to turn and that the pumpkins have become the staple of most markets, I find myself yearning for the ultimate comfort foods around. This kind of dish is not only quite budget-friendly (you pay less for these tougher cuts of meat that need a long time to slowly cook) but it's also a great way to feed a hungry crowd with little effort. Once you've browned your meat and nicely caramelized the bottom of your pan, all you need is to add a flavourful base - in this case pancetta, onions, carrots and herbs - and some liquid to cook the roast in. The hardest part of this type of meal really is the waiting. I imagine that in large dwellings it may be easier to seek refuge in one corner of your space so you don't have to endure the warm aromatic smell of slow-cooked meat, but in my cookie-cutter Toronto condo, you really can't escape the sweet aromas of the kitchen. For the few hours needed to bring this meat to fork-tender perfection, my apartment turns into a haze of goodness. And the best part? The leftovers! I'm not usually a big leftovers person - I like creating a new meal from scratch whenever I can - but this lends itself so perfectly to be tossed with a freshly cooked bowl of herbed pasta, or piled high to top toasted focaccia bread. Season pork generously with salt and pepper. Heat oil on medium heat in large Dutch oven. Add pork and brown on all sides for about 2 minutes per side. Remove from pot and set aside. Add pancetta to the Dutch oven; cook for 2 minutes. Add onions, garlic and carrots, and cook until onion is translucent, about 3 minutes. Stir in thyme and bay leaves. Return pork to the pot, on top of vegetables. Add crushed tomatoes, tomato paste and enough chicken stock to come about 2/3 up the side of the pork. Bring stock to a boil, reduce to a simmer, cover and set to cook in the oven for 3 hours, or until meat is fork tender. Remove pork from the pot, tent with foil and set to rest for 20 minutes. In the meantime, strain the sauce discarding vegetables and herbs. Return sauce to the pot and simmer to thicken if needed. Shred pork using a fork and top with sauce. Enjoy! I can just imagine your impatience while waiting for it to cook. That's a long cooking time. It looks well worth waiting for. What a fantastic pork roast! One of our favorite Sunday dinners...but I usually just pop it in the oven with some garlic and herbs. This is a must try recipe...the hubby will be delighted! Your house must have smelled incredible! I love braising meats and this recipe looks terrific! 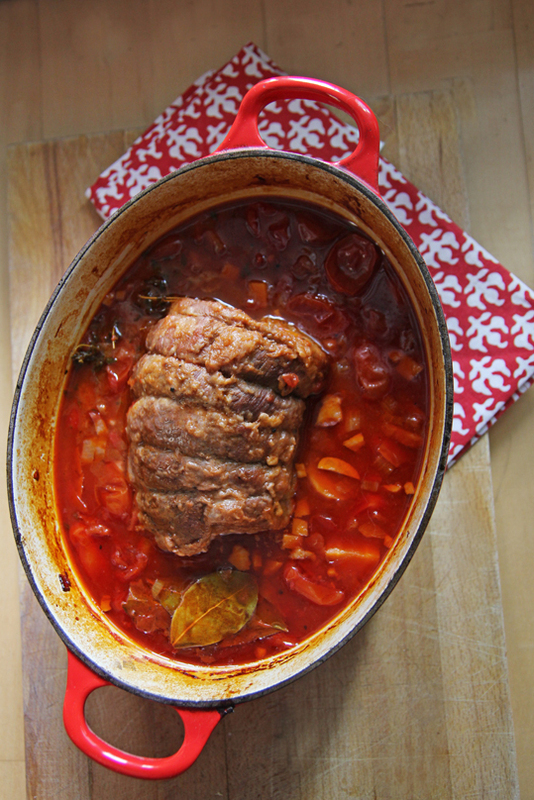 Had a nice sweet / sour slow cooker roast last week.... maybe this will be this week's version! oh my gosh this is fantastic! i need to try this! I agree with the others. Your house must smell incredible. This is a perfect dish for our fall weather. And it could be used for guests too. A win win combination. Oh MY! This dish looks fabulous. One that I could count on the entire family eating, and that doesn't happen to often anymore. I haven't done pork in months... You have inspired me! I really should put my slow cooker to more use, this looks so cosy! Thanks to watching too much Diners, Drive Ins, and Dives, I've been craving roasted pork like none other, but hadn't found a recipe I really wanted to tackle. This looks outstanding! oh my GOD. I need this comfort food. Im a winter/autumn person and even though I love spring, I am clinging onto my slow cooker like a child to a blanky. I love this. Miss T: This is the perfect comfort food - I hope you give the recipe a try! This was fabulous, and my two year old loved it as well (which earns bonus points in my book)! I did deviate slightly: after pulling the pork out of the pot, I also pulled the bay leaves and thyme stems, then puréed everything left. It made a fabulous sauce to serve with my pork and buttered noodles. A light salad on the side and it was a perfect dinner. Thanks for posting - this one is bookmarked! Anonymous: I'm so glad you enjoyed it! It's always one of my go-tos when I'm craving comfort food!